The benefit of wall-to-wall carpeting is the warm and cozy look it adds to your rooms. 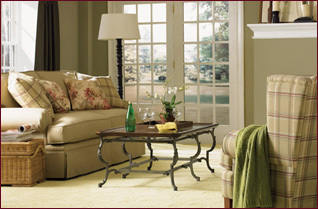 You can anchor your whole decorating color scheme on your carpet style and color. In a den or basement where it is colder a good quality underlayment of carpet pad and a dense carpet will warm the space. Offered in a variety of colors, styles, patterns, shapes and sizes. These are great if you do not want wall-to-wall and if you like change. Move them to a different room for a different look. If there dirty we can have someone clean them there or pick them up and clean them and bring them back. Many different price points are available and if you need to warm up a room in a flash this is the way to go. Area Rugs can also be used on top of wall-to-wall carpet to define a space or carry color onto the floor to complete your decorating look. Today, carpet manufacturers are up to date on the green movement and allergy concerns. There are many selections and styles to choose from that will make you very happy. There are even carpets that chemically free get rid of smoking odors and pet odors. Let us guide you to the right selection and price point. We make it simple: carpet, installation, and pad - one price no hidden fees. Call (631) 470-3544 or email us for an appointment for your free consultation on your carpet project .